PDT and Passivehaus_ME Annual Meeting + passivSLAM! Architects and Passive House affiliates from Connecticut, Massachusetts, and Maine gathered at the Friends School of Portland for the annual meeting in April. Mass timber is best applied as a competitor to concrete construction. Timber is lighter, offers carbon reductions, and can be erected faster than concrete. Here’s the cast-in-place concrete floor being poured at the lower level of the Freeport High School addition. Workers are leveling the freshly placed concrete and performing various finishing activities. What might seem like a simple floor system actually has many components that work together. The yellow material being covered in concrete is the under-slab vapor retarder that keeps moisture in the soil from entering the finished slab. A layer of extruded polystyrene insulation is hidden underneath the vapor retarder. Orange radiant heat tubes, attached to a layer of welded wire mesh and embedded in the concrete, will provide a comfortable and efficient source of heat for new rooms on the building’s perimeter. Blog post by Bob Curtis. On March 16th, Günter Lang, Austrian passivhaus expert, gave a presentation on the Passive House building standard. The term Passive House refers to a rigorous, voluntary standard for energy efficiency in a building. A project that follows Passive House principles results in an ultra-low energy building that requires little energy for space heating or cooling. Thermal comfort is achieved to a maximum extent through passive measures (insulation, heat recovery, passive use of solar energy and internal heat sources). Günter Lang’s presentation demonstrated the great potential and versatility of the Passive House standard not only for single family residences which are most commonly associated with the standard, but also for apartment buildings, affordable housing, schools, courthouses, healthcare, office buildings, retrofits and entire city districts. Sponsored by passivhausMAINE and AIA Maine, the talk referenced a variety of large scale building types and a variety of construction types to show that there are many ways of building a Passive House building. 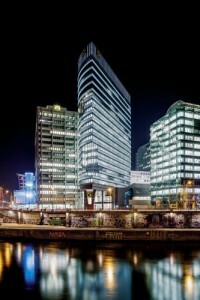 First Passive House Skyscraper The corporate headquarters of Austrian Raiffeisen-Holding in Vienna, rising 240 feet, only 60 feet wide, and with a glazed double-skin façade, exceeds our previous perceptions of what a Passive House looks like, and for the first time a skyscraper was designed and built (by Atelier Hayde Architekten and Architekt Maurer) to meet Passive House standards. The World’s Largest Passive House district Heidelberg’s Bahnstadt is the world’s largest Passive House district. Bahnstadt is a model for how Passive House can become the standard for large scale developments, districts and entire cities. Prefabricated Wood High-Rise Construction (or An 8 Story Building Built In 8 Days)The LifeCycle Tower ONE in Dornbirn, Austria was completed in 2012 and is a PassiveHaus certified high rise constructed with prefabricated wood and reinforced masonry components. Prefabrication allowed for the 8 story building to be assembled on-site in 8 days. LifeCycle Tower TWO, the Illwerke Montafon Center in Montafon, Austria, of the same construction type, was also completed in 2012. The Illwerke Montafon Center is 5 stories tall, with a basement, and has approximately 100,000 sf of floor space. These buildings demonstrate how passive house standards can be applied to both mid- and high-rise wood construction and prefabricated modules. Wood towers and Passive House skyscrapers will be seen more and more in the future. The double facade will be used more often around the world. A precedent has been set for pre-manufactured Passive House buildings that can be used for temporary housing and then relocated to different sites as necessary. Gunter Lang emphasized that the Passive House standard can successfully be incorporated into any building design (everything emits energy!) and implemented into local policies and codes as well. Design simple buildings with simple systems. Design buildings that passively use the sun, water, earth and air as much as advanced building systems. Design with energy use reduction and a high performance envelope in mind. Be a good advocate. Most buildings built now will need to exist in the future without reliance on fossil fuels so design for that now. Design and construct a high performance envelope by minimizing (and eliminating) thermal bridging, super-insulating walls and ceilings, and sealing every hole! Optimize indoor air quality by using HRV’s and ERV’s for ventilation, fresh air supply, and humidity control, and use low and no-VOC interior finishes and products. Perhaps one of the most interesting presentations was given by Nabih Tahan of Cree Buildings. His presentation outlined a prefabrication process for an eight story office building in Austria that meets the passive house standards. The concrete core was built first onsite. The wall and floor assemblies (wood structure with thin concrete floor slabs) were built offsite and then assembled onsite in only 8 days. The conference was full of many other interesting presentations and ideas including panelized construction, real time temperature and humidity sensors in walls, the introduction of the PHPP (Passive House Planning Package) modelling software, and a Portland area PassivHaus tour. For more information, see the links below. Five of us from PDT headed down to the NESEA Building Energy 14 conference earlier this week for all-day workshops. Read below for some highlights from our sessions, and see future posts for even more detail. Barbara Batshalom from the Sustainable Performance Institute (SPI) talked about how AEC firms can effectively institutionalize sustainability throughout all aspects of their business – from office culture to operations to project delivery methods. Random acts of sustainability that meet some level of sustainable metrics are nowhere as important or impactful on the environment than a portfolio of projects that come from a common commitment and an information rich process. Clearly defined and articulated goals that are at the core of a firm’s best practices have much greater impact on the social, economic and built environment. Peter Yost from Building Green talked about the need for architects and builders to manage both energy and moisture equally in the design and construction of buildings. Managing moisture as intensely as we manage energy is key to building durability and indoor air quality (source: Building Green). Selection of materials is the crucial first step in managing bulk water, capillary action, air transport of water, and diffusion of water vapor in building assemblies. How we bring materials together into wall, floor, and roof assemblies determines building performance and the quality of human comfort. Joe Lstiburek from Building Science Corporation talked about how the perfect wall needs to address four principle control layers. In order of importance, those layers are: the water control layer, the air control layer, the vapor control layer, and the thermal control layer. A building is an environmental separator – it has to keep the outside out and the inside in (source: Building Science Corporation). Just as Peter Yost stressed the importance of water management, Joe Lstiburek summed it up: Buildings get wet. Design buildings to dry. This session included a panel of experts from the Community Preservation Corporation, Steven Winter Associates, Efficiency Maine, and NSTAR. The morning presentation began with the basics of how to audit an existing multifamily property - what to look at and how to analyze the infrastructure to determine the effectiveness of the existing systems. As far as energy use analysis, some good questions to ask are: What uses energy in my building? What energy use cost me the most in my building? How energy efficient could my building be? Which building components and systems interact with each other? In the afternoon, the experts, all from different parts of New England, reviewed case studies of various types of multifamily buildings to answer detailed questions on specific buildings, specific retrofits, and specific problems.